I added a mod to add table & border colors and border styles. It was a relatively easy mod, but since I'm not a programmer, I need some guidance. The changes work fine when creating the table. 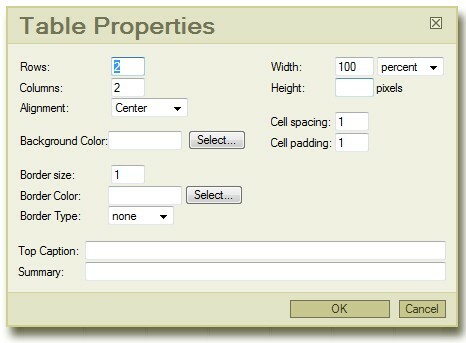 After saving the document, when I try to edit the table properties, I don't see the OK button. I have attached the editor/dialog/fck_table.html below for reference. I've marked the sections I added. Works great, but can't edit a table. Window looks like the attached screenshot. Even though it works like a charm, there is no OK button when editing the table. I need HELP, please!